The 1960’s and 1970’s in the U.S. was a renaissance period for motorcycling and during those years bikes took on many forms to suit the growing market for the huge baby boomer market. El Paso, Texas was no different and there were motorcycle dealers or repair shops everywhere to meet the growing demand. Back then, it was common to be introduced to 2 wheels by riding a minibike with a Briggs or Tecumseh lawnmower engine, scrub brakes, small wheels and centrifugal clutch. If the interest continued, then he or she would progress into a larger trail bike or street bike. A popular practice was to strip off the lights and install knobby tires, a number plate and go racing. Consequently, the sport of Motocross became very popular in the late 60’s and early 70’s, mostly due to the low cost compared to other types of motorcycle or car racing. The sport of Motocross was in its early years and most tracks had very loose racing rules, allowing riders to race just about anything they would take to the track. At the time, there were at least 20 brands of motocross bikes worldwide and most were manufactured by European companies offering purpose built, competitive, expensive racing bikes. Brothers Pat & Mike Hanlon fell in love with motorcycles at a very early age. Being from an Army family of seven in El Paso and having very few luxuries in the late 60’s, the brothers pooled their lawn mowing and paper route money and bought a new “old school” minibike from White’s Automotive for $99.00. 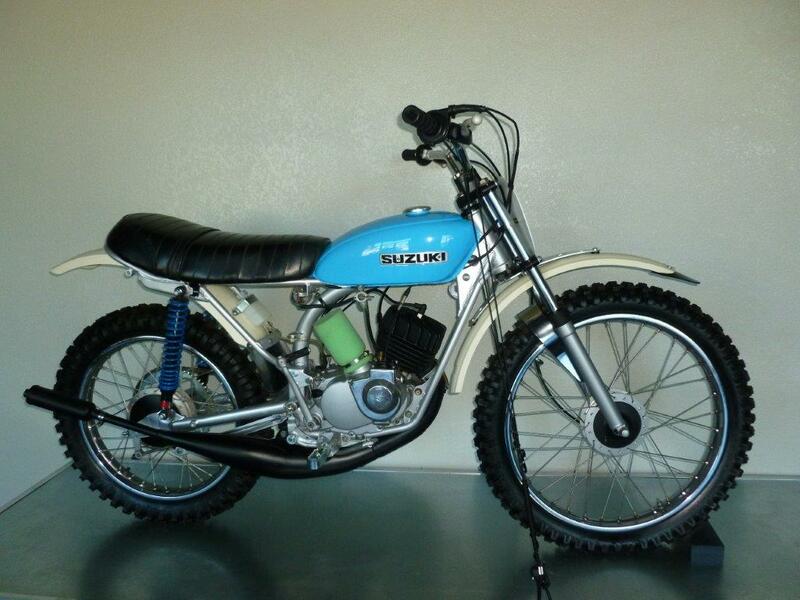 They shared it until the wheels almost fell off and enough money was saved to purchase their first full size trail bike, a brand-new blue 1971 Suzuki TS90. Not being able afford to purchase a “real” European motocross bike, the brothers soon stripped the Suzuki and modified it to race. The bike below is an exact replica of the original Hanlon Brothers Suzuki 90 race bike, including the factory 100cc hop up kit and expansion chamber, 21” wheel and extended wheelbase. This bike was shared every other Sunday race and the brothers would pit for each other for two race seasons. Eventually they bought their own bikes & raced successfully throughout the 70’s and early 80’s. Racing careers have long ago ended, but the Hanlon brother’s passion lives on with the Hill Country Motorheads Vintage Motorcycle Museum. Copyright © 2018 Hill Country Motorheads Vintage Motorcycle Museum. Wednesday through Saturday 10:00 am – 5:00 pm.